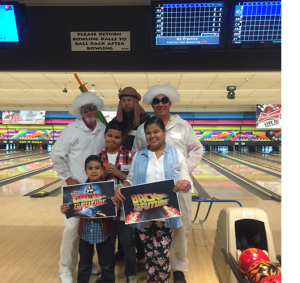 Star Roofing Inc would like to thank all who came out to support the community charity bowling event for New Pathways for Youth held on the 4th of June. The theme was favorite Sci-Fi character – The Star team choice was Back to the Future. The event raised over $15000.00 for Pathway for Youth. 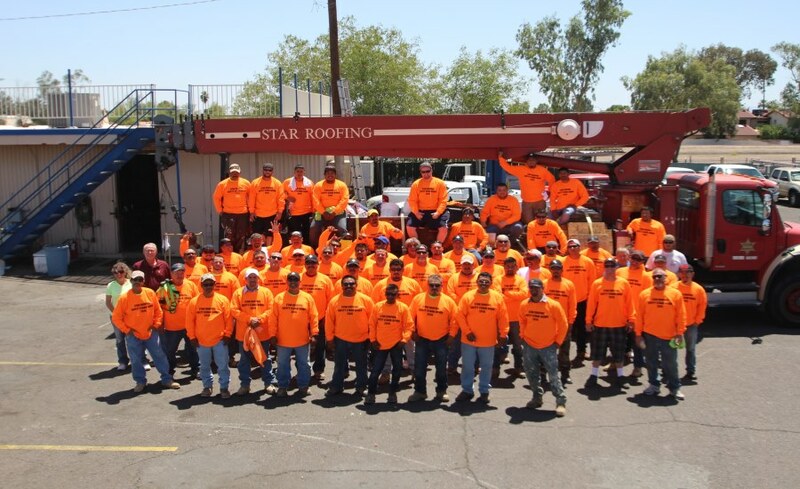 Star Roofing Celebrates National Safety Stand Down Phoenix Roofing Company Star Roofing Inc. The 58 field employees of Star Roofing participated in a special Fall Protection Stand-Down on May 4. Employees responded to questions regarding fall protection and ladder safety. In addition, all personal fall protection harnesses were checked and tagged. Special shirts were provided to keep safety awareness in the forefront. Star Roofing Inc. Roofing Foreman Juan Barranco demonstrates how to install and seal a roofing vent at the Arizona Construction Career Day. Star Roofing also had a roofing crane on display at the event. This is a great event which supports the growing need for students, teachers and career counselors to understand better the many career opportunities that are available in the Construction Industry. ACCD was initiated by the Arizona Construction Career Days (AZCCD) event team in 2007. This came about due to the event becoming a larger event and needed more than just a committee; thus became the Association for Construction Career Development. Visit the ACCD Website for more detail and entry requirements. What is spray foam and why use it? Sprayed Polyurethane Foam is fluid applied using plural-component spray equipment to fill cracks and crevices. It then expands approximately 30 times its original liquid volume to form a hard, closed cell, monolithic roof surface. The Polyurethane Foam dries within seconds after applied to the roof’s surface. Its’ expansion results in a weather tight roofing membrane that is fully adhered to the substrate. Because polyurethane is lightweight, it adds little additional weight to the structure. Polyurethane Foam has a history of more than 35 years as a maintainable roofing medium. Polyurethane Foam adds excellent insulation value to the structure, and utility bills can reflect the difference, up to 30%-70% on energy consumption! Once the SPF has been applied to the proper thickness and finish specifications, protective layers of elastomeric coating and granules are applied. The reason for the elastomeric coating is to protect the foam from the sun. If the foam is exposed to the sun, it can oxidize and wear away. This protective layer produces a durable, weather resistant surface that can be walked on for normal maintenance. But don’t take our word for it below is an email from a customer whose roof was done almost a year ago. You completed the installation of our new foam roof in late December 2013. Shortly after completion, a contractor friend of mine looked at the roof and commented it was the best looking installation of a foam roof he had seen. On September 8, 2014, we had a near record rainfall in our area giving the new roof it’s first serious test. It performed flawlessly. I inspected the roof after the storm and it looks just as good as the day it was finished. No runs, no drips, no errors. After only 8 full months with our new foam roof, we got a notice from APS adjusting our Equalizer payment for electricity. Our payment for the next 12 months has gone down $26.57 per month. Great job on our new roof. Obviously, I will recommend Star Roofing to anyone needing a new roof.